Home › Latest Promotions › August 2018 Chrome and Tyre Deals! August 2018 Chrome and Tyre Deals! You don't have a stock personality, do you? Take your motorcycle to the next level with our August chrome and tyre specials! 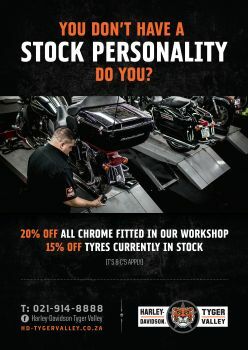 20% OFF ALL chrome and 15% OFF all tyres fitted in our workshop during August.